For his latest project, writer/director Mark Steven Johnson has gathered a team of talented actors to re-tell the true story of the bank heist which led to the largest manhunt in FBI history. Finding Steve McQueen centres on a gang of thieves who get a tip that Richard Nixon is hiding $30 million dollars of illegal campaign contributions in a California bank vault. 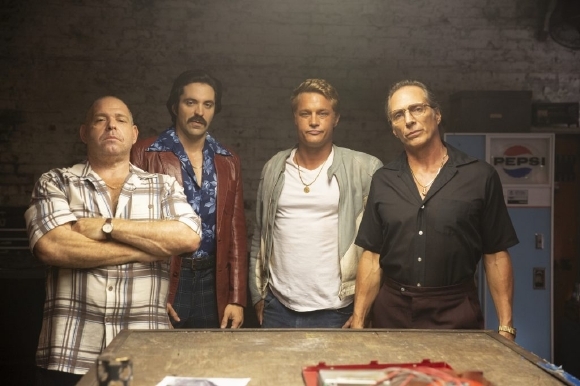 In a stroke of genius planning the gang, led by Enzo Rotella, played by the great William Fichter, travel to California, pull off the heist and then proceed to get caught - with the exception of one member who goes on the run and remains undetected for seven years. 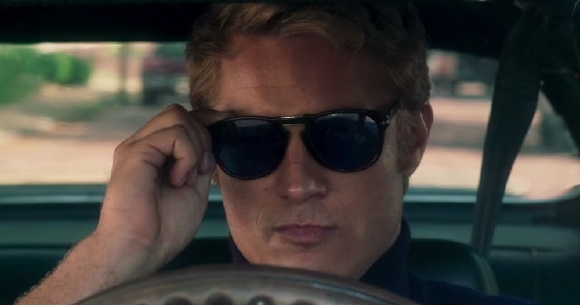 Along with Fichter, the movie also stars Forest Whitaker, Rachael Taylor, Lily Rabe and Travis Fimmel who takes centre stage as Harry Barber, the Steve McQueen-obsessed late addition to the gang who manages to remain ahead of the FBI for nearly a decade. Finding Steve McQueen is a refreshing heist movie. Mark Steve Johnson keeps the movie moving at a great pace, the tone is lighthearted and the movie features a great set of performances, particularly from Fimmel who brilliantly captures Barber. I recently had the chance to pose a few questions to Johnson and he was kind enough to share some insights about casting, balancing tone and the difficulties of editing a movie with so many different timelines in play. 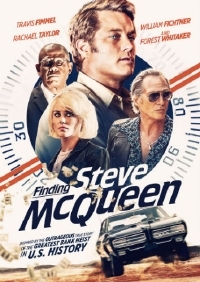 Finding Steve McQueen opens theatrically and will be available on VOD on March 15. Quiet Earth: How did you come to the project and was this the first time you'd heard about the heist? Mark Steve Johnson: The producer, Anthony Mastromauro, sent me the screenplay a few years back. The writer was Keith Sharon, a journalist for The Orange County Register, and the script was based on a series he wrote for the paper about this bizarre heist entitled "Stealing Nixons Millions." I was fascinated with the story and I thought that, surely, this couldn't be a true story. But it was. And I was hooked. This is very much an ensemble film but Travis Fimmel anchors the story. He seems like an unlikely choice based on his previous projects but he's absolutely perfect. Was is difficult to cast the role or was he always your first choice? I really didn't know what to expect when I met Travis. I mostly knew him from "Vikings." I knew he was an incredibly handsome guy, looked like Steve McQueen, and was very physical. But what surprised me was how funny he was. Travis is very self-deprecating. He loves taking the piss out of himself or anyone else. Very Australian! And I was excited about the chance to show a different side to him as an actor. Part of the reason the movie is so enjoyable is that it's so lighthearted. Was it difficult to strike the balance with the comedy, especially since so many of the really fun moments are situational? I really wanted to try to juggle different tones in the film. It can be very funny at times and even a bit broad. But it also has some very bittersweet moments as well. I learned that on Grumpy Old Men. You can have broad comedy but you also need to have those moments to remind the audience that these are real people. Without those moments the movie isn't grounded. I think in this film we have those moments between Harry and Holly. And Harry and his brother Tommy. And, of course, any scenes with Forest Whitaker and Lily Rabe are lovely and nuanced. Such great actors. The movie has great pacing. Could you talk a little about the editing process and working with Kathryn Himmoff & Julia Juaniz, and the process of finding the right balance between the timelines? There are a lot of moving parts but the movie never feels bogged down by any of it. This was a very challenging film from an editing perspective. The movie has no less than five separate timelines going. We continually jump from 1980 in the diner... then back to before Harry made the crew circa 1970... then before the heist takes place... and then we jump to after the heist and meet Forest Whitaker's character as he begins his investigation... and then go back to the actual heist... etc. It's enough to make your head swim! And to make it even more challenging the heist doesn't happen in one night - they break into the same bank three nights in a row - Friday, Saturday, and Sunday night. Which is amazing in itself. I credit Kathryn Himoff with making this all work. She's a brilliant editor and has the patience of a saint! In a normal editing process you lose scenes that don't work all the time. But in this case if you cut something the whole structure would come down like a house of cards. What was the most challenging aspect of making the film? The most challenging part of the film was the budget. This was by far the smallest budget I've ever worked with and that makes some things, like car chases, very difficult. It's pretty stressful when you only have one working GTO! If you crash the car you are wrapped for the day. We shot the film in Atlanta which had to double as Youngstown, Ohio, Washing, D.C., a small town in Pennsylvania, and Laguna Niguel, California. I really had a wonderful production team that faced a lot of adversity on this film, from my production designer to my cinematographer to my first assistant director and everyone else. They are all legends and I am forever in their debt. I have a little comedy that I love called Patrick 1.5 that I wrote and am directing. I'm in the middle of casting now and hope to be shooting in the late summer/fall. I also have a movie starring Shirley MacLaine that I wrote and am producing called Lucy Boomer that I hope will be going into production soon.